Are consumers around the world cutting back on their Pumpkin Spice Latte fix due to worries about the U.S. presidential election? Starbucks (SBUX) said the contentious battle between Donald Trump and Hillary Clinton may be keeping some customers on the sidelines. During its earnings call with analysts Thursday evening, Starbucks CEO Howard Schultz, who has endorsed Clinton, said, "Wherever we have been, I don't think we've ever witnessed such concern about what could happen in the U.S. as a result of the election." Schultz said he and other executives were recently in China and Japan and that the race between Clinton and Trump is all anyone can talk about there as well. "We don't want to use the uncertainty in the election as an excuse. But nevertheless, we are all trying to navigate through a difficult time," he said. "I would label this time as just a high degree of uncertainty that obviously is domestically driven, but has affected the rest of the world." Neither Schultz or other executives on the call mentioned Trump or Clinton by name. Related: What's with the new green Starbucks holiday cups? But it is somewhat telling that Starbucks thinks customers outside of the U.S. are this nervous about the election outcome. Starbucks CFO Scott Harlan Maw said election uncertainty "continues to weigh on our customers around the globe." And sales growth in China, Japan and Europe was lower than it was in the U.S.
Schultz expressed confidence that this will be a temporary phenomenon. Things may go back to normal once this long and increasingly nasty presidential race is finally over. You could argue the campaign is more bitter than a cup of French Roast. "I think everyone is hoping that post the election, there will be a return to a natural state of affairs in terms of the consumer behavior," Schultz said. Starbucks is not the only major restaurant company to cite the election as a problem this quarter. Starbucks rival Dunkin' Brands (DNKN) did as well. McDonald's (MCD), Taco Bell owner Yum! Brands (YUM) and Popeyes Louisiana Kitchen (PLKI) have also said the election was having an impact on their traffic and sales. But the good news for Starbucks is that the company's most loyal customers don't appear to be the ones who are cutting back. The king of coffee's overall earnings and sales topped Wall Street's forecasts. The stock rose 3% on the news Friday. 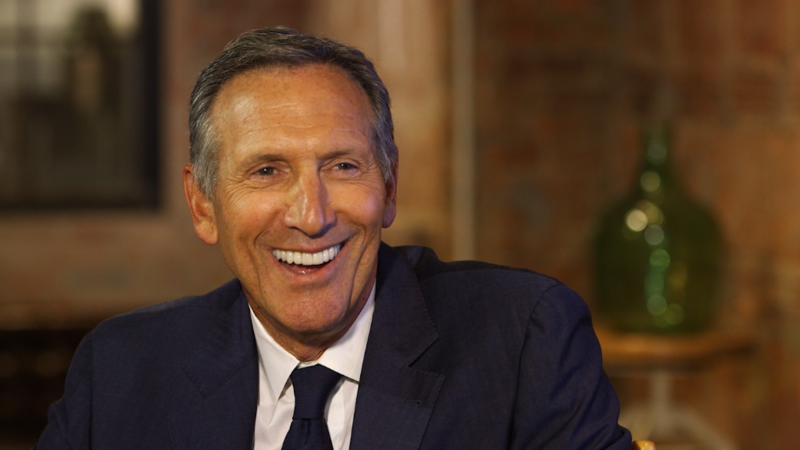 The solid sales may help allay concerns of any backlash from Trump supporters to Starbucks because of Schultz's support of Clinton. Starbucks also announced it was boosting its dividend to shareholders by a more than Venti-sized 25%. So that probably helped. Shares are still down 11% this year though. There have been concerns, outside of any election impact, about whether more consumers are giving up their caffeine fix. To that end, Starbucks noted that traffic at locations open at least a year was down 1% in the U.S. during the quarter. But sales still rose 4% despite the fewer visits. The average order rose 6% in the quarter, partly a reflection of a recent price hike for some products due to the rising cost of coffee on the commodities markets. But it's also an indication that the company's biggest Frappuccino addicts are buying even more when they stop at Starbucks. The somewhat controversial change in the company's loyalty program also may be having an impact on how often they go to Starbucks and what they buy there. Starbucks is now rewarding customers for how much they spend instead of how many times they visit a store. That gives loyalty customers incentive to buy more -- and perhaps make purchases for coworkers to bring back to the office -- as opposed to just simply going two or three times a day to buy one beverage. Wall Street analysts also continue to be impressed by the company's use of technology to make ordering more efficient. Nomura analyst Mark Kalinowski noted that mobile ordering now accounts for 25% of all orders, up from 20% a year ago. BTIG's Peter Saleh said in a report that Starbucks has "digital adoption that is hard to match right now." Starbucks clearly gets technology -- more so than many other restaurant chains. That isn't expected to change anytime soon. The company's COO Kevin Johnson is a former exec with Microsoft (MSFT)and Juniper Networks (JNPR). And he is widely viewed on Wall Street to be the most likely successor for Schultz if he ever decides to step down.